Photo: Speakers at a seminar jointly organized by Centre for Genocide Studies of Dhaka University and ActionAid Bangladesh at special conference Room of Nabab Nawab Ali Chowdhury senate Bhaban in the camps in Dhaka on Thursday, December 06, 2018. Dhaka, Dec 6 : Two of every three women, around 66 percent, have suffered from domestic violence and 72.7 percent of them never disclosed their experience to others in Bangladesh. A joint research conducted by ActionAid Bangladesh and Jatiyo Nari Nirjaton Protirodh Forum (JNNPF) titled “Spotlight on violence Against Women in Bangladesh: Trends and Solution” revealed the information. 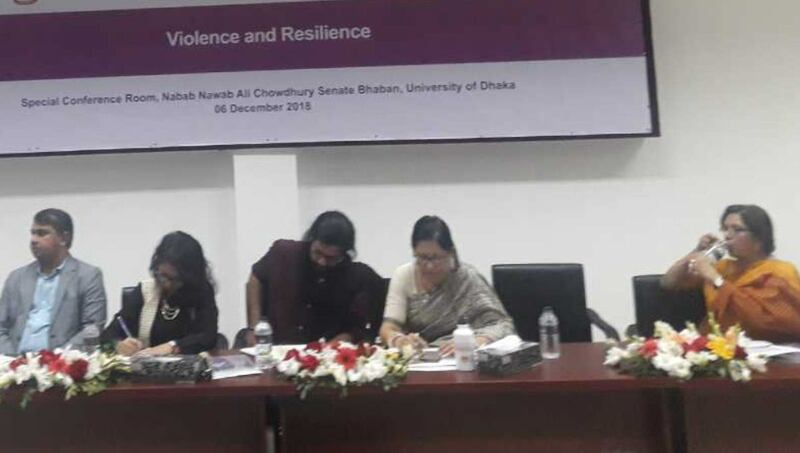 Centre for Genocide Studies of Dhaka University (DU) and ActionAid Bangladesh on Thursday jointly organised a seminar titled “Violence and Resilience” to publish the outcome of the research at the special conference Room of Nabab Nawab Ali Chowdhury senate Bhaban of DU. According to the research, most of the women in Bangladesh still suffer from chronic abuse, torture and violence in their home. Despite high rates of partner violence, most women don’t want to disclose their experience to others. “But there is only 3.1 percent chance that the court will rule in favour of the survivor. On the other hand, there is 32 percent chance that the court will dismiss the case and release the perpetrator,” it said. “We must create public awareness specially among the male to protest these gender base violence against women and ensure a bright future to all,” he added. Farah Kabir, country director of ActionAid Bangladesh, AM Nasir Uddin, Manager-Disaster Risk Reduction of ActionAid Bangladesh, Taslima Yasmin, Assistant Professor of DU law department and Tasnuva Ahmed, Head of Operations of Colours FM, among others, addressed the seminar.